Elliptical, smooth spores that are either amyloid or inamyloid, but never dextrinoid. The microscopic characters are usually not needed to successfully determine you are looking at a Cystoderma, since the granulated coating is so distinctive. Mushrooms in a few brown-spored genera can look very similar, but a spore print eliminates confusion handily. Some species of Lepiota--particularly those in the deadly Lepiota josserandii complex--can appear superficially similar, but have free gills and differ on microscopic features. Mushrooms in this genus flourish in northern Europe, where much of the recent Cystoderma research originates. In North America, Cystoderma species are fairly widely distributed in northern and montane areas and, sometimes, elsewhere. While not rare, they are not exactly prolific, either. Cystoderma amianthinum: Usually under conifers, often in moss; cap yellowish brown to yellowish, 2-5 cm; spores 4-7 µ long, amyloid; cystidia absent. Cystoderma cinnabarinum: Usually under conifers; cap cinnabar red to orange, 3-8 cm; spores 4-5 µ long, inamyloid; cheilocystidia present. 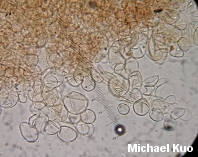 Cystoderma granulosum: On disturbed ground or in moss under hardwoods or conifers; cap brown to reddish brown or orange-brown, 1-5 cm; spores 3.5-5 µ long, inamyloid; cystidia absent. Cystoderma jasonis: Usually under conifers, often in moss; cap yellowish brown, 2-5 cm; spores 6-8 µ long, amyloid; cystidia absent. Franco-Molano, A. E. (1993). Studies on Cystoderma: A new species and a new combination. Mycologia 85: 672-676. Harmaja, H. (1979). Studies in the genus Cystoderma. Karstenia 19: 25-29. Smith, A. H. & Singer, R. (1945). A monograph on the genus Cystoderma. Papers of the Michigan Academy of Science 30: 71-124.